ATWATER VILLAGE - It has been more than sixty years since the legendary Red Car street cars rumbled over the L.A. River on a narrow bridge connecting Silver Lake and Atwater Village. Today, all that remains of that span are five concrete towers or piers that once supported the train tracks. But those same piers will once again support a new Red Car bridge, this one for pedestrians and cyclists. Officials and residents recently gathered to ring a vintage trolley bell to signal the start of construction of the $4 million project, which is located in the shadow of the landmark Glendale-Hyperion Bridge. The idea of rebuilding the old trolley bridge had been around for years. But it was the need to strengthen the Glendale-Hyperion span against earthquakes that created momentum for the new Red Car Pedestrian Bridge. 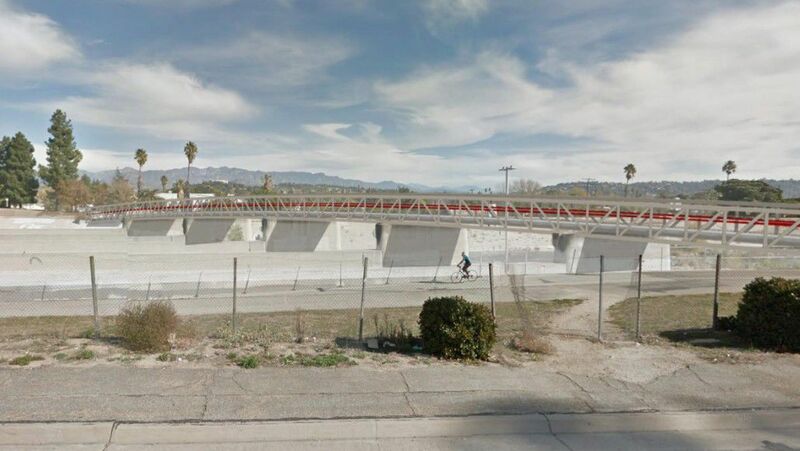 The 430-foot-long bridge will provide pedestrians and bicyclists passage over the river while the larger Glendale-Hyperion bridge undergoes and extensive retrofit and restoration scheduled to begin in 2020, officials said. The Red Car project, which is expected to take one year to complete, will also include the relocation of a mural depicting a Red Car that is currently displayed on the easternmost pier. “This new amenity has been sixteen years in the making,” Councilmember Mitch O’Farrell said in a statement. “My number one transportation priority is pedestrian safety, and this project will allow more people to safely cross the Los Angeles River." Construction is underway or just about to begin on a trio of bridges in the Glendale Narrows section of the L.A. River. None are intended for motor vehicles. The new bridge has been criticized by activists who had wanted bike lanes and sidewalks on both sides of the Glendale-Hyperion bridge. They noted that pedestrians who now walk across the Glendale-Hyperion bridge will now face a longer trip across the Red Car span. The Red Car project is part of a bridge-building boom in this section of the L.A. River. But none of the spans are intended for motor vehicles. Instead, the new spans are intended for pedestrians, cyclists and, in one case, equestrians. “We’re excited about the [Red Car] bridge, and we look forward to walking across in a years time,” said Netty Carr, Friends of Atwater Village, said in a statement. Confusing story. This bridge as shown an explained goes over nothing but the river, not across the I-5 Freeway as well. It will not take you where the Hyperion Bridge would, which is all the way across to Silver Lake and with no way to merely the bank on the other side of the river. But the story keeps talking about it getting people to the other side, where the Hyperion Bridge would otherwise take them, while the Hyperion Bridge project is underway. And the Hyperion Bridge does not take you to the bank on the other side of the river, as this footbridge will. And this footbridge will not take you across I-5 to Silver Lake A better comparison would be to the BS, ugly and dramatically overpriced footbridge to be built across the river on the other side of the Los Feliz Blvd bridge. That bridge is a preposterously and offensively tall suspension bridge for such a very short span! And at a cost quadruple the design for this bridge near the Hyperion bridge.